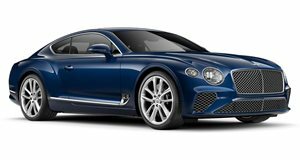 Powered by a 6.0-liter twin-turbocharged W12, the 3rd generation Bentley Continental GT possesses absolutely crushing outputs of 626bhp and 664 lb-ft, channeled to all four wheels via an 8-speed dual clutch automatic transmission. 0-60mph performance is brisk at 3.6 seconds, and top speed is an impressive 207mph. No special trims exist, but all Continental GTs boast luxuriant hand crafted interiors made to spec. Optional safety equipment includes traffic sign recognition, adaptive cruise control with forward collision avoidance, and an infrared night vision camera. When the original Bentley Continental GT debuted in 2003, it redefined the modern luxury Grand Tourer. It also polarized opinion on its looks. 14 years later and the Continental GT is the definitive luxury GT – and one of the most stylish vehicles around. Now, we’re on the cusp of the 3rd generation Continental GT – recently displayed at the 2017 Frankfurt Motor Show, and due for arrival in the U.S. in mid 2018. The new car is now underpinned by the same platform shared by the latest Porsche Panamera, itself a proven performer and luxury ‘sedan’. 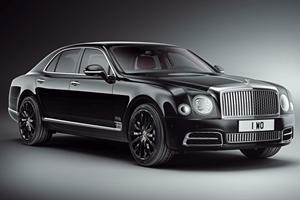 As is to be expected from Bentley, levels of luxury far surpass anything you’d find in a BMW or Mercedes-Benz. Interior materials display incredible attention to detail, such as a tolerance of just 0.1mm or 1/250th of an inch, visible on the Cotes de Geneve machined aluminum finish on the dash, or in the diamond knurled air vents and bezels. Up to 108 square feet of wooden veneer is used in the hand crafting of each Continental GT’s interior. Standard front seats are 12-way powered, but optional items are 20-way adjustable with varying foam densities in each area to improve comfort. Pneumatic side bolsters are included, specifically engineered not to crease the leather. Though classified as a 2+2 seater, rear room is still decent, though head room is tight for those taller than about 5ft 10in. Interior noise levels are also incredibly refined due to laminated acoustic glass for the windscreen and side windows – reducing noise by 9 decibels. The new Continental GT rides on a new three-chamber air spring suspension system that features 60% more air volume than a standard air suspension system. The 4 driving modes – Sport, Comfort, Bentley, and Custom – tailor the chassis’ ride height, dampening, roll control, and torque distribution for maximum comfort, or driving performance when needed. 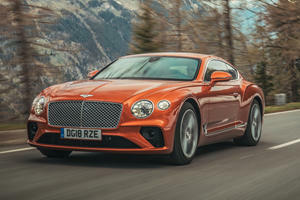 The Continental GT is the second Bentley to incorporate Bentley’s Dynamic Ride, utilizing active roll control to keep the body flat through cornering and smooth over rough surfaces. Electronically power assisted steering is standard, and all-wheel drive ensures perfect grip in all conditions. Grip levels are aided further by Pirelli P Zero tires, with larger diameter tires at the rear than the front.. Stopping power is guaranteed, thanks to 16.5-inch diameter brake discs up front with 10-piston calipers, and 15-inch diameter discs at the rear with four piston calipers. 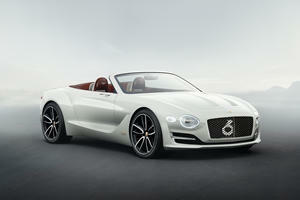 Powering the Bentley Continental GT is a hand built 6.0-liter twin-turbo W12 engine. 626 brake horsepower and a massive 664 lb-ft are available from the compact 12-cylinder. All-wheel drive is standard, with the gearbox of choice being an 8-speed dual-clutch automatic with variable shift times. 0-60mph takes an incredibly brief 3.6 seconds using a launch control system, and the top speed achievable is 207mph. For the sake of economy and emissions, the Continental GT features auto stop/start, and cylinder deactivation that shuts down half the engine under low engine load scenarios. The Continental GT boasts a 12.3-inch high resolution touch screen housed within Bentley’s rotating display; a 3 sided information unit that can be rotated to display 3 information gauges (air temperature, a compass, and a clock), the infotainment screen, or a panel of veneer matched to the rest of the interior. The instrument gauge panel is a Bentley version of Audi’s virtual cockpit. Navigation is standard, and sound systems are optionable between 3, ranging from 650 watts to 2 200 watts. Optional safety features include traffic sign recognition, blind spot assistance, 360-degree cameras, adaptive cruise control, pedestrian avoidance, and even a night vision camera. With insane power mated to ultimate control and most pristine luxury, the 3rd generation Bentley Continental GT is the car that is all things to all people. What started as a defining car in the luxury grand tourer segment is now the ultimate grand tourer. After the Bentayga set a new SUV record last year, Bentley has its sights on another Pikes Peak record this year.